I wouldn’t call myself a skirt girl by any means. I actually don’t own very many and rarely buy them, but sometimes a piece is just so good I have to scoop it up! With it being super humid and almost unbearably hot in Texas the last few weeks, putting on jeans has been somewhat torturous. I’ve been wearing more shorts than I usually do, and have kept my eye out for cute skirts to throw in the mix so that I can keep as cool as possible. As with most of my purchases, I try to locate items that can do double duty for casual daytime looks or dressed up for a night out. 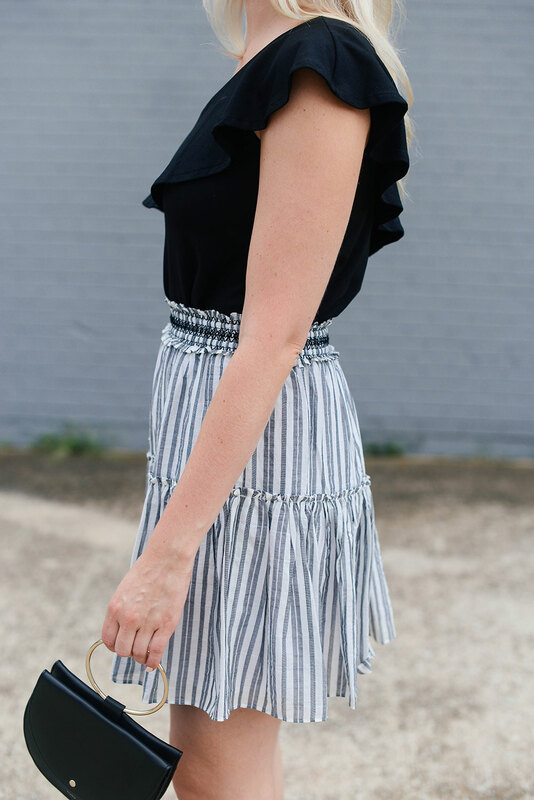 When I spotted this striped skirt at Nordstrom, I thought it would be just the ticket! It looks great with simple tanks and tees during the day, and looks just as awesome with more elevated tops and accessories for dinner. 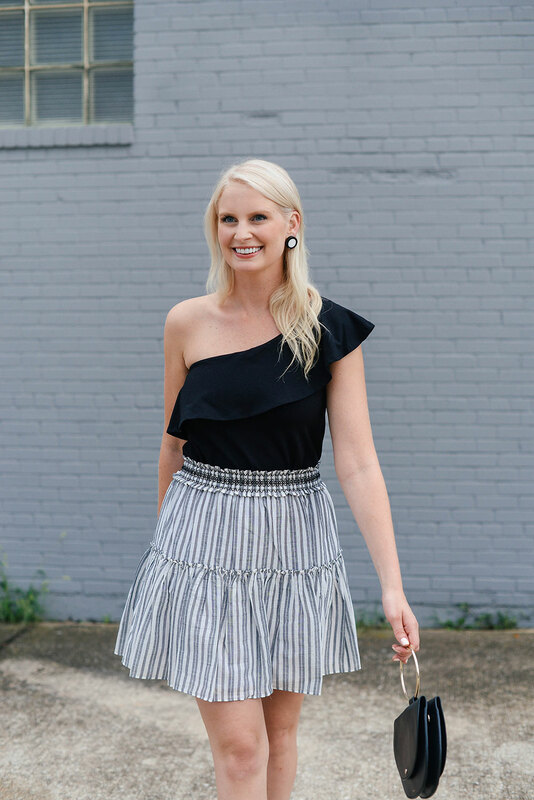 The black, white and grey color scheme works really well in my closet – so many possibilities when you consider all of the solid black and white tops I own! I wore this look to dinner when my mom was in town last week! I’ve paired the skirt with this one-shoulder top I purchased earlier this spring (back in stock!!). It’s really comfortable and I actually do not have to wear a bra, which is always a plus! It has a built-in shelf bra, which offers some support and keeps things where they’re supposed to be. Susana Monaco’s jersey fabrics are so soft and pliable too – they’re all comfy enough to sleep in! I highly recommend this top if you like to go sans bra or if you’re looking for a good staple top for nights out. Transition it to fall with jeans and booties! This adorable little gingham mini is under $80 and a great way to try the trend! Here’s another gingham style under $50. Loving the mixed stripes on this blue + white belted skirt. So crisp! This belted utility skirt is under $90 and would be such a gorgeous everyday staple for work! Dolce & Gabbana prints are always fantastic, and this floral skirt is no exception. A simple + clean white skirt for wearing with whatever on the weekends. PS – it’s only $70! This fluttery pale blue skirt is such a pretty summer shade, don’t you think? Nothing like a flattering A-line silhouette, am I right? This mini is too cute. This hot pink pleated skirt is under $30 and such a fun pop of color! This Josie Natori skirt is another fabulous work wardrobe essential! It’s a little more pricey, but the neutral color and sophisticated silhouette would be totally worth the investment. Not taking a trip to Italy this season? Pretend you’re there with this colorful midi skirt. Hoping this white broderie anglaise skirt will make it’s way into my closet soon. Love the flippy silhouette and its versatility! Did I mention it’s only $40? That skirt was a great buy! I love the stripes and style of it. It also looks like a versatile skirt (Dressed up or dressed down), which I love!